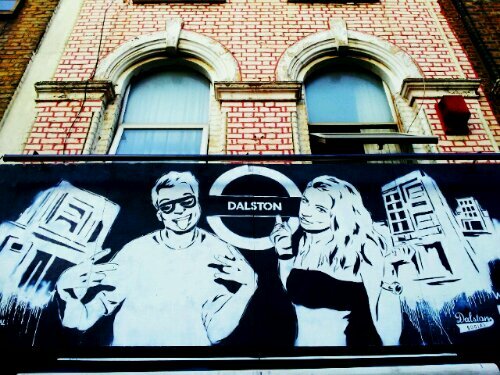 The scaffolding over the entrance of the ‘Dalston Social’ bar indicates the presence of one of Londons newest street art talents. The busy location on Stoke Newington Road is playing host to Zabou, a French artist who has been steadily building a reputation for herself since moving to the city from France around 18 months ago. 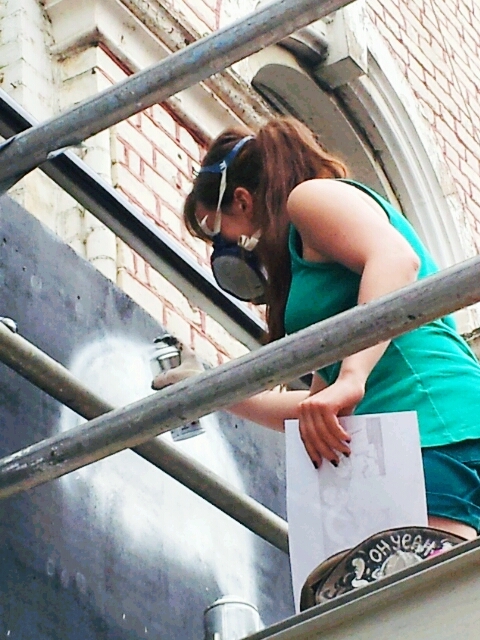 She has a master’s degree in digital arts and got into street art whilst studying in the city. Art it would seems is instinctive! Zabou says that the first thing she ever held was a pencil, indications perhaps of what future calling would lie ahead. “There is no day without creation for me” she explains, “every day I need to do something which is art, I need to produce something, I need to create something”. It’s clear what her motivation is for doing what she does, “I’ve got so many ideas all the time” she says “I’m just so excited about any project”. 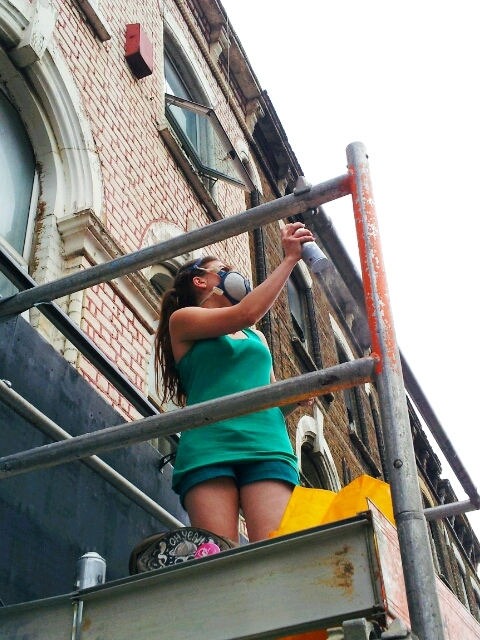 Watching her work on a 5 metre mural over the door of the Dalston Social it’s clear to see the passion that goes into the work. She’s set a tough deadline for herself, starting at 4pm and aiming to finish by 8pm . The people from the bar seem delighted that the empty space above the door has been transformed into one which more aptly represents the environment. Over the past year she’s been very active painting in Stockwell initially before really concentrating her talents on the Dalston area. There’s also more to come with work lined up from wall owners she’s approached and who like the idea of their property being painted. Street art she says “is kind of trendy”. Painting murals with spray cans was something always she wanted to try and after meeting a friend whilst studying, began to learn how. 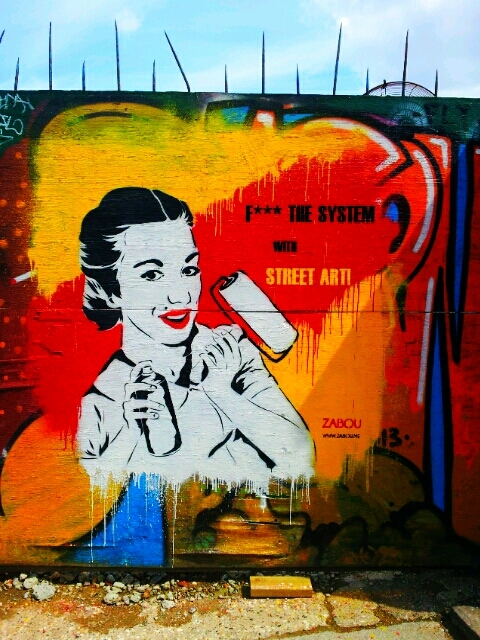 That friend, a street artist himself named Rula, helped Zabou to learn this new discipline. 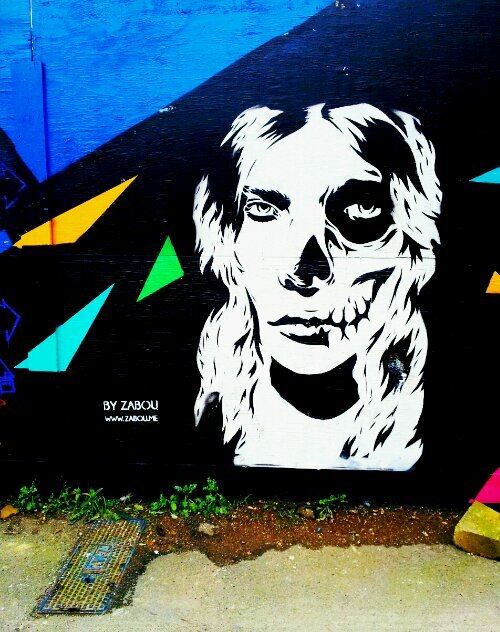 Zabou’s work is quite striking, a mixture of stencil and freehand art, her images are often bold black and white often with splashes of vibrant colour. She takes energy from her surroundings often taking inspiration from the local area. When asked to describe her work she is vague “I don’t like to give too many clues about my work” she says, “I like people to be able to project their own views on it and give their own interpretation”. Often her work depicts women, they are more interesting to look at she says “since I was little I always drew more women”. 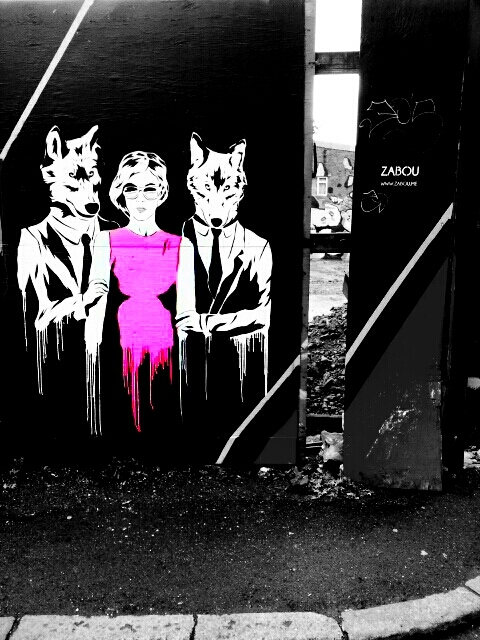 One of the recent pieces around the Hartwell Street area of Dalston included a glamorous looking pink lady flanked by two wolves wearing suits. It’s quite obvious what this should represent she says “it depicts how men can often be wolves”. The animals wearing suits is one of the trademark images to be found in a lot of her work. 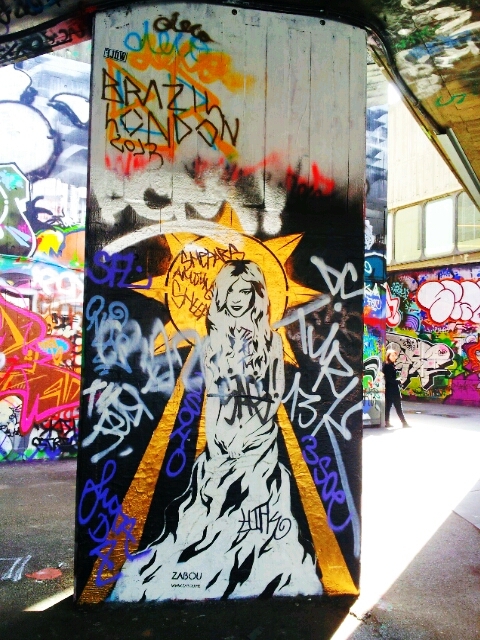 Another piece in the same area depicted a woman from a 1950’s poster holding a spray can and saying ‘F**K the System’. She liked the idea of turning the stereotypical image of women from that time on its head by placing a spray can in her hand. “It becomes a symbol of empowerment” she says. As for her name, what does it actually mean? “Nothing” she says “everyone has known me as Zabou since I was 10 years old”. Her real name is Elisabeth! “Eli – sab – beth” she articulates further. People took the ‘zab’ sound and just added the ‘ou’ “it seemed to make sense to use this as my street art name, nobody ever calls me anything else”.